Epithelial cell ingrowth is a rare complication of LASIK eye surgery (<1%), this case history describes the management of a patient who was treated for cell ingrowth, however, the patient developed flap melt and button holes in the flap. Unfortunately from an optical perspective there was a high residual cylinder (around 5D) and best corrected visual acuity in spectacles was only 6/18. As a result of the irregular corneal shape and poor acuity there was little option except some form of rigid contact lens to improve acuity. In cases such as these, large diameter semi-scleral lenses are ideal. They correct corneal irregularities without applying mechanical pressure on the cornea – something which in the present case was deemed to be essential. The fit of the contact lens can be seen in the picture below. 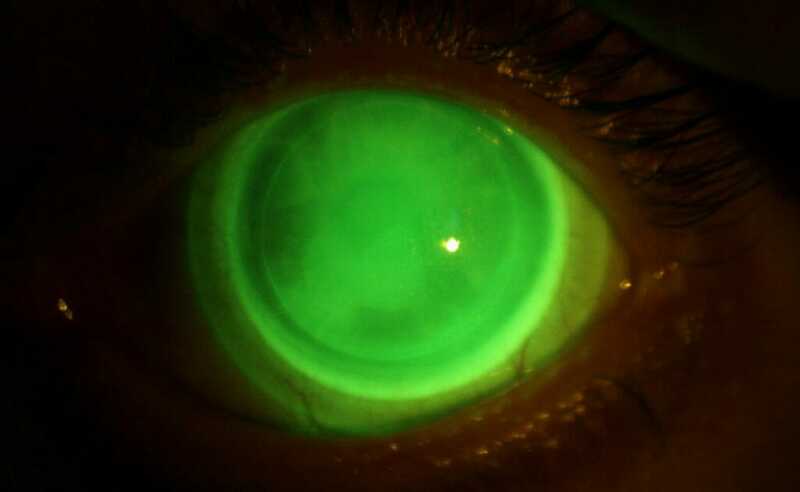 The fluorescein image was taken approximately 30 mins post insertion – thus allowing for some settling of the lens (large diameter lenses ‘bed’ into the conjunctiva so it is recommended to evaluate fit after 20-30minutes of wear). Customisation to the lens was required to achieve this result. The diameter of the optic was increased to ensure clearance of the lens from the limbal area. Furthermore, the peripheral scleral curves were also flattened in order to prevent compression on the conjunctiva. Overall, the results were extremely good, the patient wears the lens for 6-8 hours and reports high levels of comfort, furthermore, acuity is 6/9.5+. 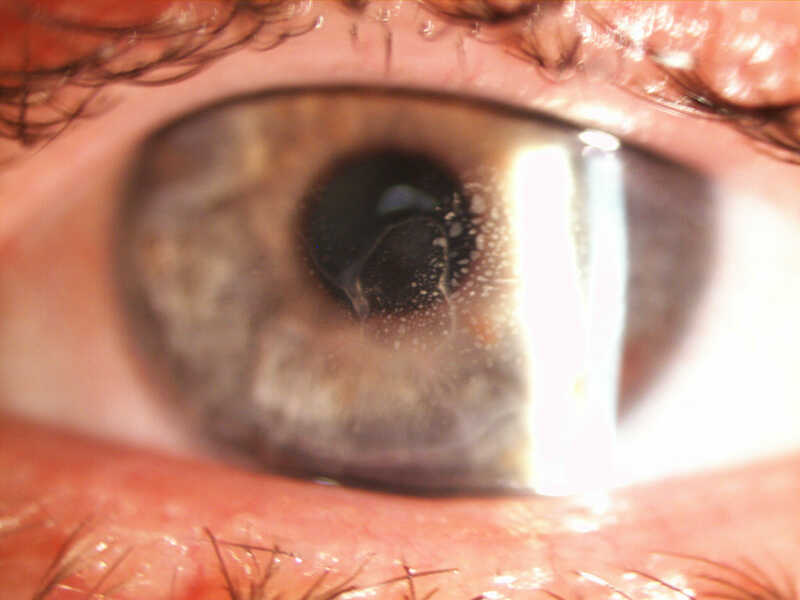 Confirmation that the lens is not bearing on the cornea is achieved by viewing a corneal section. One should see a green band of fluorescein between the lens and the cornea. The video below shows the method and how to roughly determine the thickness of the post lens tear layer thickness. Ophthalmologists interested in referring complex medical contact lens fittings to Dr. Dave should in the first instance email reception@2020eyes.co.uk.